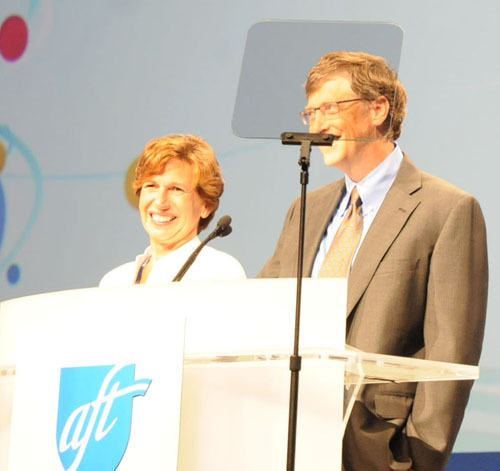 AFT President Randi Weingarten (left) feted Bill Gates during the 2010 union's national convention in Seattle. Gates delivered a keynote address to the convention, while workers attempting to unionize Microsoft and other high-tech corporate powerhouses in the Pacific Northwest were snubbed by the teachers union. Substance photo by George N. Schmidt.NEW TACTIC ON TEACHER EVALUATIONS: Randi Weingarten, president of the American Federation of Teachers, is launching a campaign against using value-added metrics to evaluate teacher effectiveness. Her mantra: �VAM is a sham.� That�s a notable shift for the AFT and its affiliates, which have previously ratified contracts and endorsed evaluation systems that rely on VAM. Weingarten tells Morning Education that she has always been leery of value-added �but we rolled up our sleeves, acted in good faith and tried to make it work.� Now, she says, she�s disillusioned. . . .
A few weeks later, in March of 2013, Weingarten co-authored a Gates-funded infomercial piece in the New Republic with Vicki Phillips to praise the results of Gates-funded research that had found that VAM was a terrific strategy for evaluating teachers. So much for �junk science,� I guess. Anyone who is keen to offer more encouragement to Randi Weingarten to continue her well-charted path of obfuscating misleadership of AFT needs her head examined. How can Weingarten oppose VAM when she supports PAARC and Common Core, which are grounded by VAM? I truly admire Mr. Horn's work and assure you he knows what he is talking about. His book Mismeasure of Education is the kind of book we need more of so people understand the complexities of education, why we test at all and how we have dropped the ball as a society. It is so surreal to watch plutocrats blame teachers for the "failure" of public schools when teachers know poverty ( arguably the fault of 1%) is the problem. Horn's book lends a great deal of credibility to our anecdotal evidence, as well as the doubts we have about AFT. I have watched Weingarten in action and she is NOT remotely interested in advocating for teachers unless the puppet masters who pull her strings tell her to do so, and we know that will never happen. Other than urging readers to buy Horn's enlightening book, I write this comment to ask why the hell Diane Ravitch continues to act like Weingarten ( her "pal") and unions in general are not a major part of the problem. Ravitch, btw, loved Horn's book ( though she failed to review it or plug it since hers was just being released at this time) . She was desperate to get Arne Duncan to read it. Weingarten ( I know this because I sent Diane and others the PDF and an email chain quickly flew around cyber space) assured her she could get a copy to Duncan. I wondered if she planned to deliver it personally or have Gates and Broad drop it off with the next bri....uh .donation. I like Ravitch and her new book is pretty good, but it is not nearly as important as what Horn has written . History will prove me right about Mismeasure of Education, but I would prefer to know what Ravitch is up to now. Thanks, Rene, for your generous assessment of TMoE. In terms of where Weingarten and Ravitch, I know there comes a time when friendship can cloud our views of what is clearly visible to others. I hope this is what has happened with Diane, for it would be a shame for the public to come to associate her the same traitorous policies that Weingarten has pursued since she was "made" by Bloomberg 4 years ago. I know Diane Ravitch is presenting to teachers and administrators, but is she reaching the necessary millions of parents who are the only ones capable of demanding a stop to the testing and common core? Although, regarding the latter, Diane has mentioned to me that she is 'agnostic' about standards, and felt (back in Sep, 2010) that some states should pilot them to see if they are worthy.